How fast is the new GeForce GTX 1070? Pretty darn fast according to the latest benchmark spilled onto the net, and in fact it edges out Nvidia's mighty Titan X. This is according to benchmarks carried out by Videocardz, which found that in 3DMark FireStrike, the average benchmark of the GTX 1070 was 3% faster than the Titan X. In performance mode (1080p), the gap was only 1%, but when in extreme mode (1440p resolution) the GTX 1070 was 4% faster, and at ultra (2160p) the new card was a full 5% faster than the old Titan. Not too shabby at all for a card which is going to pitch in under the £400 mark (under $400 over in the US). This is of course a synthetic benchmark, so performance in actual games is always going to vary – but it's definitely a promising sign. Incidentally, its bigger sibling the GTX 1080 was 24% faster on average than the 1070. The old GTX 970 hit an average benchmark of just 58% of its successor. The benchmarks were recorded with non-overclocked models. As with the GTX 1080, better power efficiency and cooler running are also major boons – as we've seen previously Nvidia claims the flagship card offers a 30% performance increase compared to the last-gen while it reduces power consumption by almost the same amount (28%). All this is thanks to the big jump from a 28nm process used in the last-gen cards to 16nm FinFET in the new offerings which simply means that more graphics hardware can be packed into a smaller space. 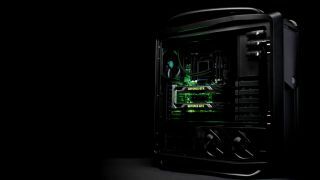 Also check out: Nvidia vs AMD: which should be your next graphics card?